My personal goal is to help people reach their financial goals. One way of doing that is through investing education. This book is my attempt to help with the development of a strong investing mindset and skillset to enable the reader in making better investment decisions and finding better investments. 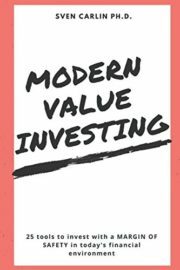 There is a gap within the value investing world. Benjamin Graham published The Intelligent Investor in 1949 with several subsequent editions up to 1972 while Seth Klarman published Margin of safety in 1991. More than 50 years have passed since Graham published his masterpiece and almost 30 since Klarman did the same. Therefore, there is the need for a contemporary book to account for all the changes the financial environment we live in. The book has 4 parts. The first part discusses the most important psychological traits a successful investor should have. Part 2 describes 25 tools that will help with the actual investment analysis and part 3 applies those tools on an example. Part 4 is food for investing thought as it discusses modern approaches to investing from an all-weather portfolio strategy to hyperbolic discounting and other things you might find interesting or take advantage of when the time will be right, even if that might happen just a few times in your life. Hope you enjoy the book and the videos posted on my YouTube channel. Sincerely appreciate your support.